"This is a tasty way to eat polenta. We use it for appetizers or with dinner." Lightly oil an 8 inch round cake pan. Bring chicken stock and butter to a boil in a large saucepan over high heat. Whisk in polenta in a steady stream, and reduce heat to medium. Simmer, stirring constantly until the polenta has thickened, and the grains are tender, 20 to 30 minutes. Be careful while stirring the polenta, it can cause burns as the bubbles pop and send hot polenta flying. 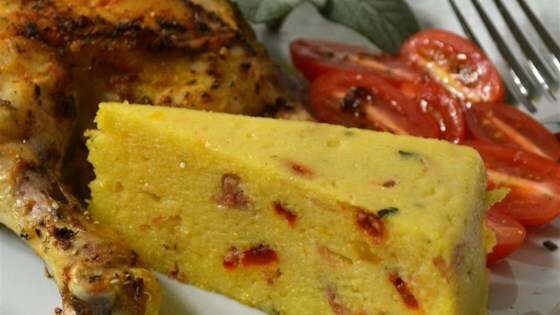 Once the polenta grains are tender, stir in the garlic, roasted pepper, prosciutto, mozzarella cheese, Parmesan cheese, Gruyere cheese, and sage leaves; cook and stir an additional 5 minutes. Season to taste with salt and pepper, and pour into prepared cake pan. Place into refrigerator, and chill until firm, about 1 hour. Preheat oven to 400 degrees F (200 degrees C). Line a baking sheet with a sheet of aluminum foil, and lightly oil. Unmold the polenta onto a cutting board, and cut into 8 wedges. Arrange the slices onto the prepared baking sheet so the slices are not touching. Bake in preheated oven until the edges begin to brown, and the polenta is hot in the center, 10 to 15 minutes. This didn't work for me at all. It smells great but it was to soupy.